Waiter In-a-Box Point of Sale is the ideal point of sale and hospitality management solution to help simplify operations for all table service restaurants, quick service restaurants and bars. In the quest for success, time becomes a valuable commodity among restaurant operators. The ability to simplify and streamline operations not only helps increase the bottom line, but creates a better working environment. Features of this innovative solution include an inventory management system, a frequent diner program, a delivery tracking system and video surveillance interface. Waiter In-a-Box Point of Sale is also affordable, extremely user friendly, easy to learn and use, and multi-lingual. 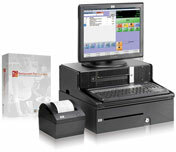 Waiter In-A-Box, Aldelo Edition, Includes: Partnertech 6910 All-in-One with Integrated MSR, APG Cash Drawer, Citizen CT-S651 Thermal Printer and Aldelo POS Software. Waiter In-a-Box, Restaurant Pro Express Edition, Includes: HP RP3000 Smartbuy, 15" Touchscreen Monitor, Thermal Receipt Printer, MSR, Keyboard and PC America Restaurant Pro Express Software.